Despite being the Premier League’s poorer cousin the Championship is one of the most competitive leagues in world football and also one of the most difficult to predict. In a league when a standout season from one striker can be the difference between a promotion push and a relegation battle there are always those that come to the fore during a campaign. Here Ladbrokes News tips five forwards that are likely to impress in the season to come. The £3m signing arrives fresh from his most successful season to date at AFC Bournemouth. A former Crystal palace youth, the now 26-year-old is something of a late bloomer. Unsuccessful spells at the Eagles, Millwall and Brentford saw Grabban drop down to League Two with Rotherham. A 21-goal haul there saw him move to Dean Court where he smashed 35 goals in 93 games – 22 of which came last year. Now firing on all cylinders the Canaries have a star striker in the making. Fulham fall into that category of club believed to be too big for the Championship and the £11m signing of McCormack shows they don’t plan on staying around too long. The Scotland international enjoyed moderately successful spells at Rangers, Motherwell and Cardiff but really blossomed at Leeds where he netted 58 goals in 154 appearances. His haul of 29 strikes last term was his biggest yet and prompted the Cottagers to pin their hopes on the 27-year-old. 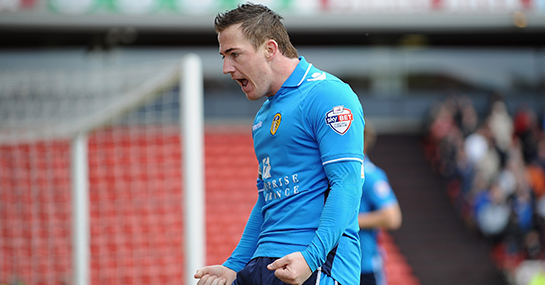 The McCormack fee could be a weight off Rhodes’ shoulders as his own £8m price tag has raised eyebrows. The 24-year-old was not rated by Roy Keane at Ipswich but proved the Irishman wrong with 87 goals in 148 games for Huddersfield. The Premier League came calling but the Scot opted for Rovers where he has hit 52 strikes in his 96 games to date. Is this the season he finally returns them to the top flight? The Udinese-owned striker is on loan for the fourth season in a row and while spells at Club Brugge and West Brom ultimately proved unsuccessful his stint at Watford two years ago saw him net 20 times in 41 games. Whether his future lies in England or Italy the 22-year-old has everything to gain from a return to his previous form with the Hornets and should be backed to bag plenty of goals this term. Wilson will be hoping Bournemouth manager Eddie Howe can have the effect on his career that Grabban enjoyed after stepping up from Coventry. Recent loan spells at non-league Kettering Town and Tamworth yielded just two goals but the 22-year-old set League One alight with 22 goals last term. He’ll vye for game time with Tokelo Rantie and Yann Kermongant, but if he can carry his form into the Championship the Cherries could go one step further in their push for the play-offs.